Today's blog post is offered as a simple educational consult for those Austin area office workers who suffer back pain. Like countless American office workers across the country, you might experience increasing pain in your lower back. If this is you, don't feel alone. Some primary care physicians state that low back pain caused by prolonged sitting at office desks is the second most common reason for visiting the doctor after colds and flu. Those same doctors are increasingly referring their patients to their local chiropractor to relieve lower back pain as opposed to prescribing opioid-based pain medications. It might not make intuitive sense that the mere act of sitting can cause back pain, but physical inactivity introduces a slew of health risks with systematic spinal compression being one of them. In some cases, simple changes like adjusting chair height, standing at your workstation, and scheduled walks can set aside your office-related back pain. In cases where back pain is severe, a trip to Austin's TexStar Chiropractic can be an instant game changer in your quality of life. Why does Sitting Cause Low Back Pain? Office workers tend to commit the mistake of spending the entire day just sitting at their desks. 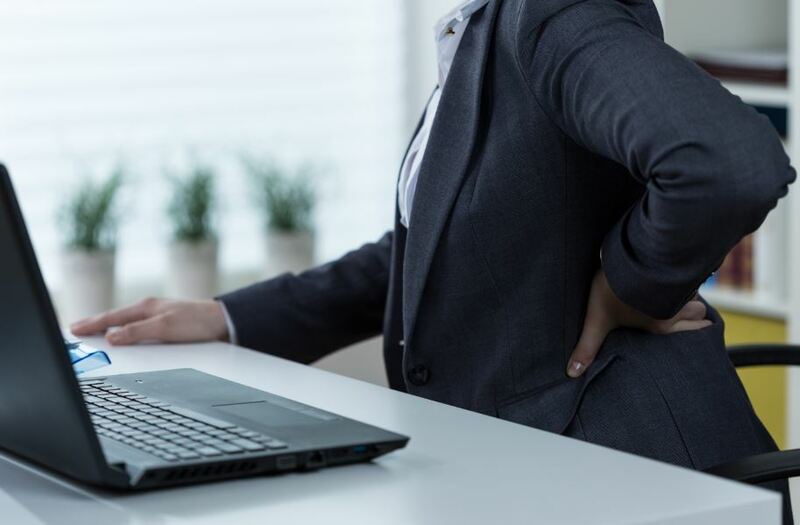 Sitting may seem like a physically harmless thing to do, but when done for prolonged periods of time, it puts a significant amount of pressure on the joints and discs of the spinal column. Poor posture is also a contributing factor to low back pain. Leaning forward, for instance, puts a lot of weight-bearing strain on the spine and increases wear and tear on the spinal joints and discs. Sitting in a fixed position also restricts blood flow to the discs between the spinal joints. With poor blood flow, the spine becomes deprived of nourishment, thus accelerating degeneration and increasing the likelihood of injuries in the lower back. Movement is essential to keeping your spine healthy and your lower back pain-free. Instead of staying in your chair the whole time, take short breaks every 20 minutes to stand up and do a bit of stretching. So you don't forget, set an alarm close by to remind you when to take a break, or leave a written note next to your computer monitor as a reminder. If you've been experiencing persistent pain in the lower back, reach out to Dr. Henry an his staff at Austin's TexStar Chiropractic for a no-obligation consult regarding your back pain. Our doctors specialize in spinal health and offer several treatments that are proven effective in providing pain relief. We've perfected the use of spinal manipulation techniques for treating every type of lower back pain. By manually adjusting the alignment of the lumbar spine, we decrease pain in the lower back, increase your range of motion, and restore your mobility. As part of your treatment, our doctors will educate you regarding office behaviors that will ensure you maintain proper spinal posture and how you can strengthen your core muscles to reduce the risk for lower back pain. The professionals at Austin's TexStar Chiropractic will gladly consult you regarding your running-related pain and discuss how you might resolve your pain without resorting to painful surgery or drugs. Call or contact us anytime!